If you have a computer, whether it be a Mac or PC software bundles are a great way to get great software at great prices. Yeah, I may need a thesaurus but this doesn’t take anything away form the Ultra-Premium Mac Bundle at StackSocial right now. All of these programs together will only cost you $44.99 US dollars. Let’s take a look at what you get. 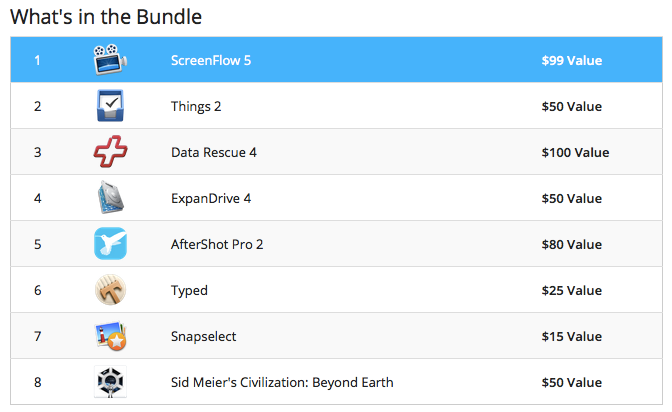 ScreenFlow 5 alone is worth the price. While some of the other software you may not want, what they are offering is inanely cheap. While I’m not a huge Civilization fan, I am a fan of Data Rescue, Things, ScreenFlow (of course) ExpanDrive and Typed (which I’m using right now) look pretty interesting. Go over and check it out yourself. The bundle is only good for a few more days, so get yours while you can. This entry was posted in Helpful Tips and tagged stack social, ultra premium mac bundle. Bookmark the permalink.